We are delighted to introduce three new sports to the School Games programme. This takes the number of sports that are part of the School Games to 44. 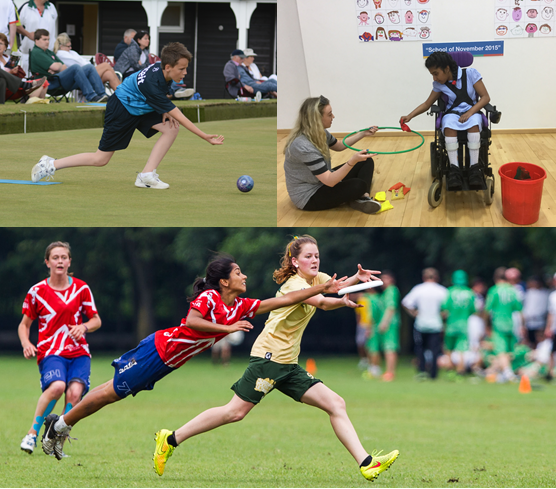 Bowls, Ultimate Frisbee (Ultimate) and Motor Activity Training Programme (MATP) have become a part of the School Games family and will provide different challenges for children up and down the country. As with all School Games sports, there are various levels of competition and free resources available. These set out to help teachers deliver high-quality physical education and run intra-school and inter-school competition formats. Bowls is a game played between individuals or teams and the aim is to roll weighted balls as close as possible to a predefined spot, called the Jack. The individual or team with one or more balls closer to the Jack wins. Ultimate is a game based on the spirit of fair play and includes no physical contact between players. Played between two teams on a pitch split into three sections, two smaller end sections and a larger middle section, players attempt to score a point by catching the frisbee in the end zone their team is attacking - with no running whilst in possession. Finally, we are delighted to welcome MATP to the School Games. Running for between 8 and 12 weeks, MATP is designed to support athletes with a severe or profound disability for a ‘challenge day’ using sensory and movement stimulation. The challenge day is designed to empower all competing athletes and challenge them to beat their personal best, not to compete against others. We can’t wait to hear about stories from up and down the country as children start to try these sports. Remember, schools can write blogs and upload them to your dashboard, and by uploading a blog you could win a prize as part of our Blog of the Week competition! To find out more about any of our sports follow the adjacent links to visit their pages on our website.